This engineering feat was accomplished by digging a 1,750-foot (533 meter) tunnel into the mountain. An ancient stone carving found near the entrance describes this incredible operation. Today, trekking through Hezekiah’s Tunnel in knee-high water is a highlight for visitors to Jerusalem. (Taken from Hezekiah's Tunnel - CityofDavid.org.il). Higher than my thighs, the water was cold, but easy to get used to. There were times when adults had to bend down a bit as the ceiling was lower in some areas. The width of the tunnel never was more narrow than what you can see in the photos below. 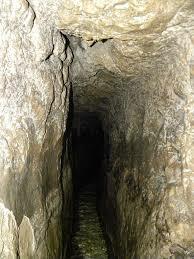 Immediately below is the video that was shown prior to our walking through Hezekiah's Tunnel. We have added a visit to Hezekiah's Tunnel to our annual tour to Israel. For those not wanting to get wet, there is also a dry tunnel that can be walked. Visit our tours by clicking here. The tunnel walls are no more narrow than this. These inscriptions were near the end of the tunnel on the wall.